A lot of people don’t realize just how costly and bandwidth intensive streaming live video on the web is from a back-end perspective. There’s a reason YouTube hasn’t launched a live service and Yahoo had to shut its down. Most end users never have to deal with such concerns because they use a service like Ustream, Justin.tv or Stickam to handle their needs on a small level. But what if you have a startup or a company that wants live streaming to be a key part of your business? Then you may want to check out Stickam’s new StreamAPI. StreamAPI is the white label version of a service Stickam’s been offering to several larger companies for a while now. While most startups probably won’t need to scale as big as an MTV-sized audience, there is still a need to have the appropriate resources to stream live to a large audience. StreamAPI can handle that while giving clients an easy to use, customizable interface and very low per-viewer hour stream rates. How low? Well, while Ustream may charge up to $1 per view hour, with StreamAPI, Stickam is willing to go as low as $0.05 per view hour (depending on quality). And a bigger draw of StreamAPI may be that you can set it up without an expert Flash developer. 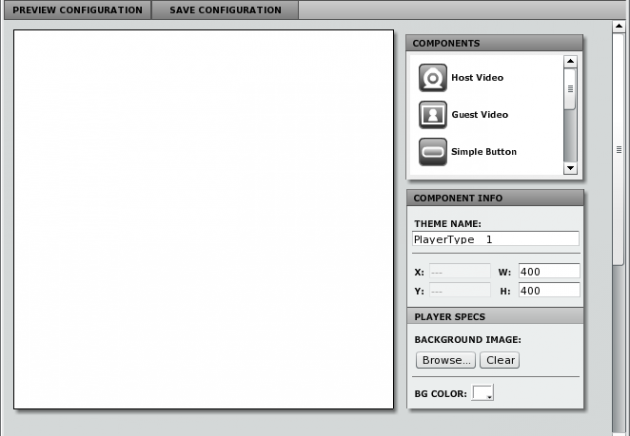 The service offers a drag and drop editor that is very simple to use. Stickam CEO Steven Fruchter walked me through the process of making your own video streaming area — it took just about a minute to have everything in place and ready to go. “We’re trying to power all live video on the internet,” Fruchter told me. And at such low prices and with a service that’s easy to use, StreamAPI is certainly a compelling offering. Stickam launched in February of 2006, before all of its big rivals, but today it’s often overshadowed by many of them. This new API is its attempt to level the playing field by providing an invaluable service to a lot of smaller startups.